This article submitted by Linda Stelling on 5/17/00. "It's hard to believe I have been in Paynesville 35 years," said Jim Elseth. Elseth is one of eight staff members retiring from the Paynesville Area School District at the end of the school year. 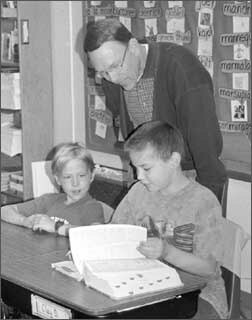 When he started teaching in 1965, Elseth's plan was to move all over the state. "I liked smaller towns. I wanted to get where there was a lake. My hometown of Newfolden did not have any lakes," he said. "I liked Paynesville and stayed." "I have taught many children of my former students," Elseth said. "It gets scary when you start teaching the next generation." Elseth has enjoyed watching his students learn science, math, and English. "I like to see children with the desire to learn. They get into a topic and read everything possible on that topic," he added. Even though there is no magic formula to get children to learn, Elseth said he continues to work with that student, showing them that he cares. "Most students are enthusiastic and energetic about learning. They bring that energy to class and I feed off their energy," said Elseth. Elseth taught sixth grade math for eight years before changing over to fourth grade where he teaches all subjects. "I enjoy teaching a variety of subjects," he said. Elseth helps Clay Domm and Steven Powers look up the word of the day. Over the years, Elseth has experienced many changes in teaching methods and technology. "We had science textbooks 35 years ago," he said. "Today, the teacher doesn't have a textbook. We work out of a unit manual. The lessons are the experiments." Telephones, televisions, VCRs, and computers were other items teachers did not have in their classrooms 35 years ago. In 1992, telephones were placed in every classroom at the elementary school making calls more convenient for teachers and students. Film projectors are an item which were common in every classroom 35 years ago. Teachers hoped the film would stayed threaded and that the projector worked, Elseth said. Students used to look forward to watching movies, he added. Not so today as videos have become a part of home entertainment. Teachers are being asked to teach a lot more these days. "Today, we are teaching family life at the fourth grade level along with the basics of reading, math, and English. There isn't enough time in the day to teach everything," he added. Elseth was glad to see that the Legislature adjusted the Profile of Learning. He has found it very frustrating to teach as they are too complex for the fourth grade level. "The profiles are time consuming and difficult to implement. There should be an easier way," he said. "There are seven packages the fourth graders are expected to get through. If we completed the profiles, we wouldn't get through our other curriculum," he said. Elseth said many teachers have a hard time understanding the profiles. "We need standards, but ones that aren't so difficult. The profiles are not written for average students, but for someone that is highly intelligent," he added. "If I stayed in teaching, I wouldn't spend as much time on the profile until the state decides which guidelines they want to use," said Elseth. Besides teaching, Elseth is also the assistant golf coach. Elseth is looking forward to retirement and spending more time with his grandson. He plans on taking up fishing again and enjoying his favorite leisure activities: golf, traveling, skiing, snowmobiling and yard work. His wife, Barb, is also retiring at the end of the school year. She is a counselor in the New London-Spicer School District.